Via his venerable MobyLives blog, Melville House founder Dennis Loy Johnson has been an outspoken critic of those who treat digital publishing and retailing as a true religion. But that’s not to suggest he’s a mere gadfly or Luddite. To the contrary, his decades-old publishing company, one that first came to prominence with the anthology, Poetry After 9/11 (a tenth anniversary edition will be released next month), has fully embraced the Web. They’ve launched the well-received Moby Awards for book trailers, issuing e-books, and experimenting with ambitious and quirky promotions, including challenging customers to read all 42 of the company’s novellas in a single month or its current commitment to reimburse anyone who buys an e-book of Andrei Kurkov’s Death and the Penguin at the promotional price of $3.99 with a coupon of the same value. Now comes the HybridBook — print editions that come “enhanced” QR Codes that, via the wave of a cell phone or tablet camera with QR code reading software, enable instant free access to supplemental digital material that includes curated texts, essays, maps, illustrations, and even recipes. 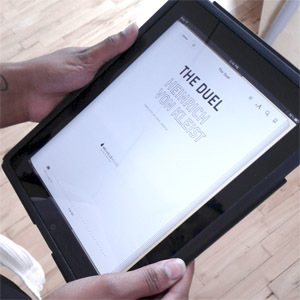 The first enhanced HybridBooks to the hit the market are part of the “The Duel x 5,” a series of five novellas all entitled The Duel, one each by Chekhov, Conrad, Kuprin, Kleist and Casanova. We spoke with Johnson about this new project. Publishing Perspectives: What was the impetus for launching HybridBook project? Johnson: We were looking for ways to work closer with brick-and-mortar book projects as we move into the new age of retail. This also entailed looking for new ways to assist booksellers to sell books, to get clientele better aware that they can still help indie booksellers sell books. Is this a reaction to a certain consumer demand? It is and it isn’t. It is an original idea from Melville house. Consumers were not necessary beating down doors. For any indie bookseller that is selling e-books, we wanted to give printed matter a specific QR code, so if people are in the store, they can buy it right there in the bookstore. Indie booksellers are always complaining that indie stores are just a display, then customers proceed to buy the e-books from Amazon right in the store. We are trying to give booksellers the opportunity to keep those sales. We do think that there is value in shopping in an indie store; you can do everything you want right there. Where would you like to take the project in the future? More books to come? Yes, we will do all of the “Art of the Novella” series, which would total 43 books, once they come along for reprint, several months a year. Also we plan to include additional titles that lend themselves to it. We have found that these “illuminations” are often longer than the books they illuminate. For example with the Kleist title which is only 80 or so pages, its “illuminations” are hundreds of pages, featuring really cool stuff. The original idea with the novellas is that they are really stripped down. When reading, I would always skip introduction, so the idea was that the [stripped down] book would speak for itself. With the illuminations, if you love the book then you will love this material. The illuminations tend not to be critical, with one exception: Bartelby the Scrivener (which will be the next HybridBook). It includes a review by Alexis de Tocqueville, who was still alive when the book came out, and who wrote a scathing review of the title. The illumination material is not necessarily overly scholarly either. It includes color art and, in the case of The Duel x 5, we also found a lot about the history of dueling. There is one example about two gentlemen in hot air balloons who duel. As you can guess, the winner shot the other’s balloon and it went crashing down. Our goal is to feature hilarious, fascinating, off-beat, and quirky content. It really speaks to our mission, to present these classic titles in fresh new ways while embracing digital as a whole, demonstrating that digital and print can exist together. Over the years, I have found that the best way to publish is also the best way to write — from the heart. I was fortunate to approach the publishing industry without any experience. So I went with what I knew. I didn’t like books with introductions, so the novellas were stripped down without introductions. The illuminations represent the kind of research I would do after reading a classic. It gives you an opportunity to follow your passions after reading a book. It is a full experience. What is your opinion is the most exciting, quintessential illuminations feature that the novellas have to offer? There is so much, so many wild things…for example, letters that Melville was writing around the time of Bartelby and the philosophy he was trying to espouse, which then lead us to giving examples of that philosophy. We have examples of his friends writing back to him, and of course the de Tocqueville criticism. We even found a newspaper ad about the book, maps from Wall Street of the day, a recipe for ginger nuts. It turns out to be from the bakeries of that time period. At the end of the day, bakers would take all the scraps that were old and moldy and throw them in vat with tons of ginger to eliminate the mold. It was the poor person’s snack food. That is what Bartelby would eat. There really is such a variety of information. Did the idea for the HybridBook originate with you? Paul Oliver, our marketing manager, is an extremely well-read guy and came up with the idea. And he has happened upon some amazing findings. The project is a huge endeavor. We waited some time to make the announcement and wanted to announce it with the launch of the five Duel titles. About the “Ultimate Duel Book Trailer Contest” that is accompanying the publication of The Duel Series, how has the turnout been? We have received a few amazing entries and have some goods ones to show off. We were surprised to get one from a professional house. The others have been amateur. But we are really pleased and I actually like the one that Nathan, our publicist, did with the cartoons and Japanese fighters. One final question, on the topic of QR scanning. I have a first generation iPad, so am I totally out of luck, since it doesn’t feature a camera? Basically the scanners are very simple, there are easily a 100 apps that are available to download the technology. You just point your smart phone at the QR code. As for your iPad 1, it is just a matter of getting the content from your smart phone to the iPad 1. It should be a pretty simple process. You can also download the illuminations supplement as a PDF or e-book (in EPUB or .mobi). DISCUSS: Will QR Codes Become the Standard for Enhancing Print Books?